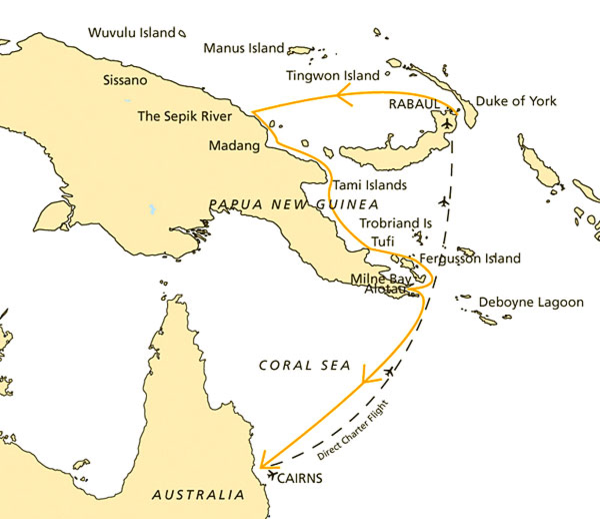 Our cruise down the East coast of Papua New Guinea followed the migration route of the Melanesian People. Each village had diffferent cultural dances and different crafts. Our arrival at the Great Barrier Reef off Cairns was timed to co-incide with the total eclipse of the sun on 14th November, 2012. Life on board Orion was most enjoyable. We were entertained and educated by the amusing stories and facts from the enthusiastic tour leader, Justin Friend, who once lived in the highlands and married a Papua New Guinean. We also had interesting lectures from Orion's field biologist, Chris Cutler and Planet Earth photographer, Sue Flood. Supporting them on our expeditions were marine biologist, Harry Christensen and Mark Watson. Being a chartered cruise we had specialist lectures from space astronaut and scientist, Tom Jones and astronomer, Jay Anderson. The delicious meals are devised by renowned Sydney Chef Serge Dansereau and we are most grateful to Hotel manager, Ian Vella and his team of waiters, barmen and cabin staff for a most excellent 6 star service. Thanks to Captain Andre Domanin we not only had a successful view of the eclipse but also a long viewing of the erupting volcano. The ancient Kula Ring was established to create strong, life-long relationships between the exchange parties. Annually, participants travel, at times, hundreds of miles by canoe in order to exchange Kula valuables which consist of shell-disc necklace (bagis) that are traded to the north (circling the ring in counter clockwise direction) and shell armbands (mwali) that are traded in the southern direction (circling clockwise). If the opening gift was an armshell, then the closing gift must be a necklace and vice versa. Many customs and traditions surround the ceremonies that accompany the exchanges. The Kula Ring spans 18 island communities of the Massim archipelago, including the Trobriand Islands and involves thousands of individuals. The terms of participation vary from region to region. In the Trobriand Islands the exchange is monopolised by the chiefs, in Dobu all men can participate. A community in the Kula looks after the next community in the Kula and hence, peace is maintained in the region. All Kula valuables are non-use items traded purely for purposes of enhancing one’s social status and prestige. It is tradition to give away something of greater value than you receive. Eventually, your own necklace and armshell come back to you when you can ‘upgrade’ it for a better one, if you wish. If a person dies, then the rest of the family continue to exchange the items in the Kula. Our cruise on Orion took us to explore the east coast of Papau New Guinea, where we delighted in the experience of some of the active volcanoes, 600 islands, atolls and coral reefs, turquoise seas, 1000 tribal groups with over 850 indigenous languages (about a third of the world's indigenous tongues). The greatest pleasure was the friendliness and welcome given by the inhabitants. Nowhere have we ever been where the locals start a conversation with you in the street or thank you for their pleasure that you have taken their photograph. At each village that we visited we were greeted with flambouyant, costumed, singing ceremonies that are a regular feature of tribal life. After which the village and ‘houses’ were open for viewing, talking to the inhabitants and taking of photos from which to remember their incredible hospitality. At every destination we were welcomed by cheery screams and joyous faces from the children, many of whom clung to the tourists whilst we explored their village. The handicrafts of the villages varied from shell jewellery, woven baskets, woven bags (known as bilums, pots and tapa cloth to elaborate masks and excellent quality wooden carvings, bowls and dishes. The families have a lifestyle of subsistence living – as long as they have enough fish and vegetables to eat that day, they are happy. If one villager catches more fish than is needed for his family then he will share it with the other villagers. They all chew betel nut mixed with mustard seed stick that has been dipped into lime powder, which results in brilliant red stained teeth. The short term effect is a sense of well-being but the long term effect includes ulcers, gum disease and cancer. Betel nuts are given as a present or peace offering. We were most surprised at the number of older generation that spoke English in addition to their indigenous language and the common Pidgin, known as Tok Pisin. Tok Pisin, was formed originally as a trading language, and has now been replaced by English as the primary language taught in schools. (its interesting to decipher the Tok Pisin. (eg What is your name? Husat nem bilong yu? - (HOO-zaht naym bee-LONG yoo?)). And white people are called dim dims! Papua New Guinea is currently one of the ‘untouched’, little-explored frontiers. 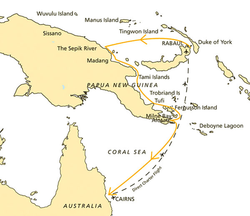 It lies entirely within the tropics on the eastern side of New Guinea Island - the second largest island in the world (the west of the island is Indonesian owned Irian Jaya). A central core of mountains, the Owen Stanley Range, runs east to west, rising steeply from the coastal plains. From its highest peaks such as the 4500 metre high Mt Wilhelm, great rivers like the Sepik and Fly River begin their journey to the sea. Vast tracts of the country are wild and undeveloped, containing the largest area of intact rainforest outside of the Amazon. The reputed ‘headhunter’, volatile highlanders are avoided by their inaccessibility and the capital, Port Moresby, with its reputation for lawlessness, is also isolated due to the lack of infrastructure over the hostile terrain. Long may Papua New Guinea and its people remain pristine and respected by those fortunate enough to visit them.